These are basic Dollarama earbuds at $1.25. 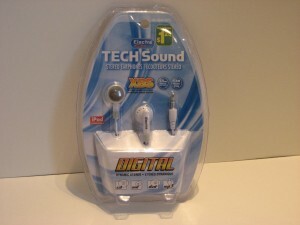 They are branded as “Electra Tech Sound”. These ones are not too bad for the price. Price – 5 / 5 At just over a dollar it can’t really be beat. So full marks here. The sound quality I would rate ast fairly decent for the price. OK for music and podcasts. These earbuds don’t have the extreme tinny sound you typically get with cheap headphones. In addition, they come with a pair of foam covers. These covers are a little thin and hard to attach but improve comfort so it’s worth the effort. They also feel reasonably sturdy. Where these fall short is in their low volume. These earphones get a positive recommendation. I only hesitated to recommend them fully if you need to use them where you need a good amount of volume such as for noisy areas and for cell phone use. I leave these at work on my computer and I have been reasonably pleased. I can just leave them around because they are cheap enough to be replaced.